A very busy December plus a video biography shoot in Missouri the first week of January all conspired against a timely January e-Newsletter! But better late than never. I wish you a very Happy New Year – and to start off 2013, this issue will feature an article on Honor Flight, a very special program honoring our veterans. I’ll also answer a question about high definition video and DVDs. Flights to Washington, D.C. Honor Veterans’ Service. My Rotary Club, the Catalina Rotary Club of Tucson, Arizona, has many military veterans as members – a number of them veterans of WWII. Knowing how quickly we’re losing our WWII vets, another club member and I spearheaded a program to interview our veterans on video. We give DVD copies to the vets, post the interviews on the club website and submit the interviews to the Veterans History Project at the Library of Congress in Washington, D.C.
Our effort began in 2009, with a goal of interviewing the seven WWII veterans in our club. Six of the seven were happy to take part. But the seventh, well, he proved a bit of a challenge. George is a wonderful man. Before the war he was playing minor league baseball. After the war he’d enjoy a brief stint in the majors. And he can still talk a blue streak about his baseball experiences. But he just didn’t feel he’d done his bit during WWII. He did serve, but through no fault of his own he was assigned to a land base and never made it to sea. The way he saw it, the time he spent throwing strikes as a pitcher on a Navy baseball team paled when compared to going to sea and striking the enemy. But then George took part in an Honor Flight – and his attitude changed. In a word, the Honor Flight Network (www.honorflight.org/) is terrific. It’s a non-profit organization that honors America’s veterans (including vets of WWII, Korea and all subsequent conflicts). The organization does this by flying vets to Washington, D.C. to visit the war memorials there and to socialize with fellow veterans. The vets pay nothing for the experience; all funds are donated by Honor Flight supporters. Each vet is accompanied on the trip by a guardian, who can be a family member or other volunteer. Guardians pay all their own expenses. The network has a number of hubs across the country. George hooked up with Honor Flight Southern Arizona (http://honorflightsaz.org/). 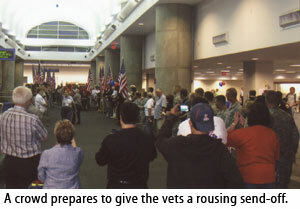 The morning of the flight from Tucson to D.C., George was amazed to find a crowd of well-wishers filling the terminal to cheer him and his group. As his plane moved away from the gate, two firetrucks lifted their hoses and gave the plane and its passengers a watery salute. The scene was repeated when the group changed planes in Houston. George’s spirits continued to soar. So what changed his mind about letting me interview him for our Rotary Club’s veterans project? During the trip, George met other veterans who didn’t have the opportunity to serve in combat. He came to realize that, the military being what it is, you follow the orders you’re given. Whether he would see action or not wasn’t up to him – and the fact that he hadn’t been on the front lines in no way minimized his service. He returned with a renewed sense of pride and a desire to tell his story. I finally interviewed George this past summer and hope to have his interview online soon. I urge you to check out the Honor Flight Network. Perhaps you can donate or volunteer your time. 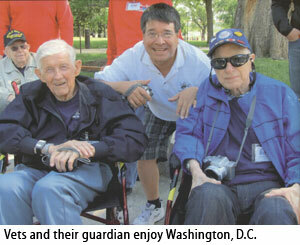 Or perhaps you know a veteran who would benefit from the Honor Flight experience. Ask Steve – This month: Trying to fit high definition video on a DVD. I enjoy your website and newsletter. My husband and I would like to shoot my father’s video, but we are running into trouble creating a dvd in high definition without using blue ray. I have a Canon HFR300 and my husband is using Adobe Premiere Elements 11. Do you have any advice on how to create a dvd in high definition on a standard dvd? Thanks for writing. There’s a good reason you’re having trouble creating a high definition disc using a standard DVD – that’s because it can’t be done. Standard DVDs play back only standard definition (SD) video. The only way to get high definition (HD) playback is by exporting your high def video as an HD file that’s compatible with Blu-ray – and then using it to create a Blu-ray disc. If your final product needs to be a DVD, you can still shoot and edit your project in high definition. But – when it comes time to create your DVD, your HD video needs to be exported as an SD DVD file. A quick glance at the specs for Premiere Elements 11 tells me that you can use the software to create both standard DVD and Blu-ray discs. Down-converted HD video played on a standard DVD still looks pretty darned good. But, again, the only way to maintain HD from acquisition to final distribution is to create a Blu-ray disc. For that, you’ll need a drive that’ll burn Blu-rays. And whoever is playing the disc will need a DVD/Blu-ray player.